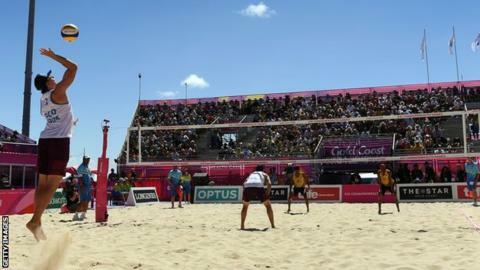 Scotland's men and women won their opening beach volleyball matches at the Gold Coast Commonwealth Games. The men's team of Seain Cook and Robin Miedzybrodzki beat Sri Lanka 2-1, 21-15 18-21 16-14. The women's team, made up of Lynne Beattie and Mel Coutts, beat Grenada 21-8 21-11. The men have still to face Sierra Leone and Canada in the preliminary stages, while the women will meet Cyprus and Australia. Beach volleyball is making its Commonwealth Games debut, with Scotland still to face Sierra Leone and Canada in the preliminary rounds.